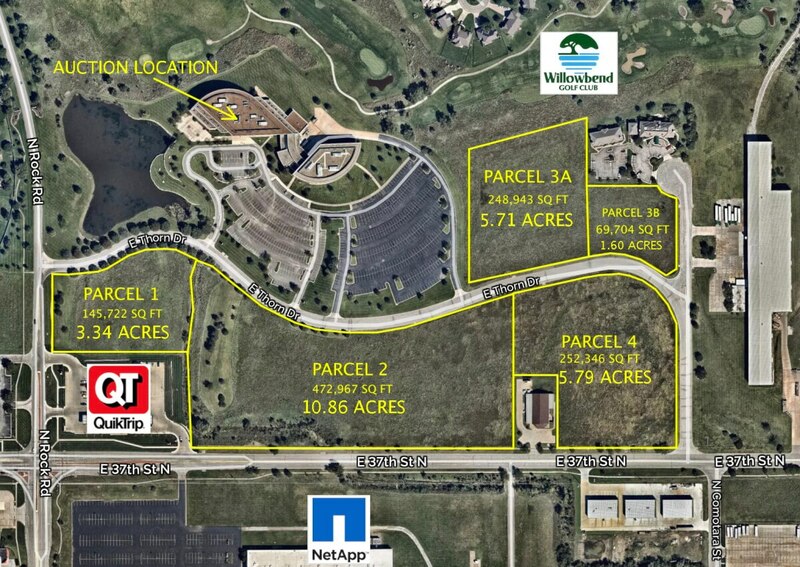 Premium Wichita Kansas development land located at the corner of 37th and Rock Rd all around a Gen 3 QuikTrip. Favorable zoning and low current holding costs. Future uses could include Commercial, Industrial, Retail, Multi-Family, Medical, ETC. Great opportunity to buy and hold or Invest in Land! SIZE: 145,722 square feet (3.34 acres). 2017 REAL ESTATE TAXES: $2.79. SIZE: 472,967 square feet (10.86 acres). 2017 REAL ESTATE TAXES: $8.46. SIZE: 179,239 square feet (5.71 acres). 2017 REAL ESTATE TAXES: $3.15. SIZE: 69,704 square feet (1.6 acres). 2017 REAL ESTATE TAXES: $1.04. SIZE: 252,346 square feet (5.79 acres). 2017 REAL ESTATE TAXES: $4.56. TERMS: There will be a 10% buyers premium added to the high bid to determine the contract price. Earnest money $25,000 down on each Parcel at the conclusion of the Auction with the balance due upon Sellers submission of merchantable title and closing. Closing date shall be on or before November 12, 2018. Closing fee and title Insurance fee will be split 50/50 between Seller and Buyer. Selling subject to easements, restrictions, roadways and rights of way. This property is not selling subject to financing or inspections. Interested buyers need to view the property prior to the date of the auction and have financing available and any inspections performed prior to bidding. All pertinent information is available upon request. All announcements made the day of the auction take precedence over any other announcements or printed material.